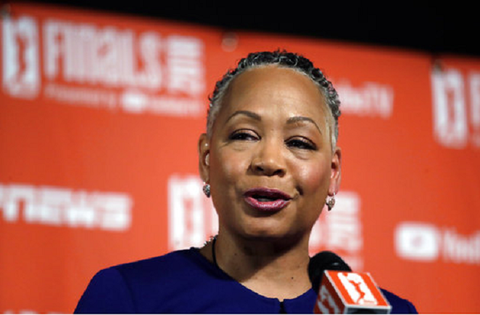 Lisa Borders announced on Tuesday her decision to step down as President of the WNBA. Borders three years leading the WNBA has seen a number of positive changes including some progress on attendance, new deals with Twitter and FanDuel, an increased viewership for national broadcasts, and an increased focus on social activism. But as the following list indicates, a number of issues will need to be addressed by the next president. And these issues aren’t just challenges, but opportunities to propel the WNBA even farther. Perhaps the biggest issues facing the WNBA is player pay. As noted at Forbes, WNBA players currently receive about 20% of league revenues while NBA players are paid about 50% of NBA revenues. This discrepancy has led a number of WNBA stars (an incomplete list would include Liz Cambage, Kelsey Plum, Skyler Diggins-Smith, A’ja Wilson, Seimone Augustus, Kia Nurse, and Brittney Griner) to argue the WNBA should pay its players as if they truly were playing in the best women’s professional basketball league in the world. Of course, if the WNBA cannot reduce other costs than this increase in pay might worsen the WNBA’s profit picture. That observation, though, leads to the next issue on this list. The WNBA hasn’t been particularly shy when it comes to discussing the league’s profits. More specifically, the WNBA has often told people that the league is not doing as well financially as some in the league prefer. In its early history, though, the NBA took a very different approach to bad news about the league. The NBA even went so far as to instruct its teams to misrepresent attendance at games. In more recent years the NBA — despite billions in revenue — has argued that many NBA teams are like the WNBA (i.e. these teams do not make a profit). There is a difference, though, between an established league (i.e. the NBA) and a new league (i.e. the WNBA) discussing the issue of profits and losses. Even if many NBA teams are losing money no one would conclude the NBA is about to go out of business. For a young sports league, this outcome is far more conceivable. This matters because when it comes to investment, it’s not just the league and owners who need to invest in the WNBA’s future. For the WNBA to thrive, more and more fans are going to have to emotionally invest in the league. Such an investment from fans will require fans to spend time watching and thinking about the league. However, if the league keeps telling fans the WNBA is not financially sound it signals to new fans that making an emotional investment in the league might not be a good idea. After all, why go to the effort of investing in the league when the league doesn’t have any future? A better approach for the WNBA is to stop focusing so much on revenues and cost. More specifically, the WNBA should follow the lead of Major League Lacrosse and characterize additional spending on players as an investment in the league. This makes sense because it really can be an investment. Imagine the WNBA paying its players enough to skip playing in leagues around the world when the WNBA season ends. This approach would reduce wear and tear on the WNBA’s primary assets. It would also mean that the WNBA’s player could work on promoting the league throughout the year. Currently, the WNBA operates in 12 markets. This means there is a number of markets that do not have a WNBA team. A list of the largest of markets without WNBA teams would include Houston, Miami, Philadelphia, Boston, San Francisco, Detroit, San Diego, and Denver. It appears there is an abundance of talent to stock new teams. Last year there were 157 players who logged minutes with one of the WNBA’s teams. In contrast, 540 players played for the 30 NBA teams in 2017-18. Like the NBA, the WNBA draws talent from both the NCAA and international basketball. But despite having a similar amount of talent to scout and evaluate, the WNBA just doesn’t have enough roster spots to employ all the amazing talent that exists in women’s basketball. Expanding to more markets would both extend the reach of the WNBA and also give fans of women’s basketball a chance to see some of the talents the league currently can’t employ because it is too small. Beyond these three items, Mechelle Voepel of ESPN notes the WNBA needs to give the new WNBA President the ability to truly lead the WNBA. Right now, too much of the decision-making is influenced by people in the NBA. The problem with this approach — as we saw in the discussion of profitability — is that the WNBA and NBA are at very different points in their history. Hence, maybe it is time for the WNBA to be led by someone who truly understands that the WNBA is simply not a woman’s version of the current NBA.